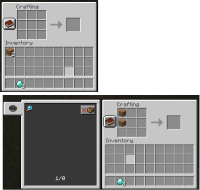 It seems with the 17w13a snapshot, no recipes are unlocked on the server so you can't really make anything. This seems to happen to everything. MC-115081 Recipes not being added to players on servers.